Today was my second day in my department. The person training me only sat with me for one day, and today I was on my own. I booked a few surgeries, did some misc scheduling for my surgeon, took some online training modules, got my pager, attended a class, and some of my other job duties too boring to mention. I think I’ll like the position. As long as I can handle the parking situation, I’ll be sticking around UofM for a while. I purchased a yellow parking pass, which is supposed to be the closest lot to the hospital…almost walking distance if you have enough time. Yesterday I drove around for almost a half hour looking for parking. I ended up down the road at the orange lot, and took the shuttle over to the hospital and was 15 minutes late on my first day. I was worried about being late, but everyone expected it and laughed it off when I walked in totally flustered. 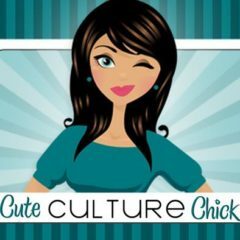 The funniest thing of the day was the gift that my new boss gave me…a pickle. She just got back from Disneyworld and Epcot, and gave me a shiny green pickle Christmas ornament. Apparently, pickles are a German Christmas tradition. A pickle would be hidden somewhere in the boughs of the tree, and the first child to find the pickle would get an extra gift from St. Nick for being so observant. 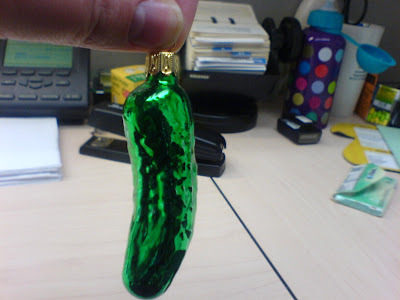 Not sure how that translates to my new position, but my new cubicle is graced with a decorative pickle. I’m still not better from the illness fiasco I’ve been dealing with for 3 weeks now. I finished up two rounds of antibiotics, but I think the infections aren’t gone yet. My throat still is swollen, my ears and eyes hurt, and my sinuses are tender and stuffy. I’ve been coming home from work and crashing on the bed to recover from these long workdays. At least I’m not sick like my friend Erin, who at 23 years of age came down with the chicken pox this week. My teeth are also still hurting like mad. I’ve been having these frightening, recurring dreams that all my teeth fall out while I’m giving a public speaking address. I’ve been brushing with Sensodyne again, but the nerve pain lingers. I opted for my insurance benefits and dental plan today, and pretty soon I’ll have the info to find out what dentist I can see. Until then, it’s Motrin every 4 hours for me.